Formatt Quick Start 5 HD/DV Graduated Neutral Density Soft Edge Filter Kit - Neutral density filters have several uses and offer the possibility to achieve otherwise unachievable results. ND filters appear grey and reduce the amount of light reaching the film. They have no effect on color balance. This kit has been specially formulated as a result of extensive research into new applications for molecular A.C.T. dyes. The filters give more of a neutral grey without the specular effects from the particulate coatings of the current neutral density and neutral density graduated filters, which allows the user more precise control. Formatt's Neutral Density Filters are a response to the many DPs and cinematographers who find that it is important to shoot as wide open as possible to minimize depth of field, especially with HD; In response to the professional demand for an optically correct and pristine neutral density filter for HD, Formatt designed its HD Neutral Density Filters, which are the ultimate solution to enhance color contrast and are ideal for normal light reduction. This filter enables the shooter to adjust exposure without affecting color balance. 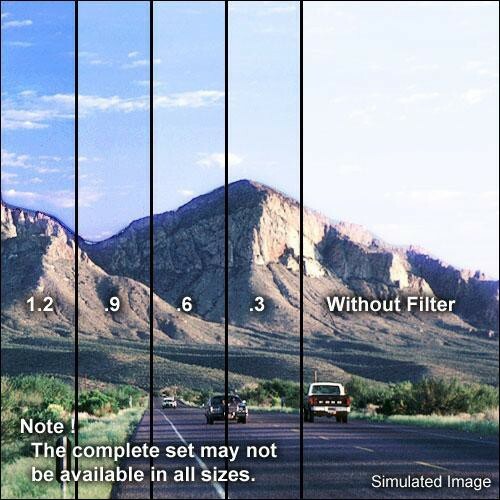 Neutral density filters are available in 1, 2, 3, or 4 stops to suit individual situations. This A.C.T. process is revolutionary compared with conventional filter dying techniques by eliminating the need to directly coat the glass surface itself; The repeatable performance gained through A.C.T. ensures that at any time you have to swap like filters for like filters mid shoot you can do so with confidence with no discernible differences in color or density. Box Dimensions (LxWxH) 10.5 x 8.5 x 6.7"
Is this horizontal or vertical grad ND ? According to Formatt, the grad filters are horizontal.